“Scientists have an obligation not to lie about the natural world.” – Lawrence Krauss. In an essay for The New Yorker titled “All Scientists Should Be Militant Atheists” Lawrence Krauss makes a powerful argument for science and against the urge to protect religious superstition from scrutiny. The Kim Davis controversy exists because, as a culture, we have elevated respect for religious sensibilities to an inappropriate level that makes society less free, not more. Religious liberty should mean that no set of religious ideals are treated differently from other ideals. The problem, obviously, is that what is sacred to one person can be meaningless (or repugnant) to another. Krauss is correct. What is a sacred commandment or belief for one is another’s moral abomination. One need only be reminded of the sexism and misogyny woven into the fabric of all three of the Abrahamic religions to understand why many would find the supposedly sacred to be morally repugnant. The refusal by Kim Davis to issue marriage licenses to gays and lesbians is another example, and there are of course many more. 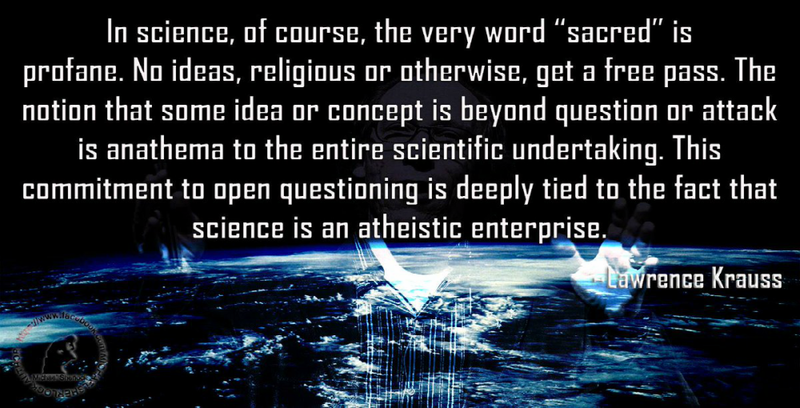 Because science holds that no idea is sacred, it’s inevitable that it draws people away from religion. Even so, to avoid offense, they sometimes misleadingly imply that today’s discoveries exist in easy harmony with preexisting religious doctrines, or remain silent rather than pointing out contradictions between science and religious doctrine. Scientists have an obligation not to lie about the natural world. Bottom line: Krauss is right, all scientists, and all thinking people, should be atheists. Lawrence Krauss is a physicist and director of the Origins Project at Arizona State University. He is also the author of The Physics of Star Trek and A Universe from Nothing: Why There Is Something Rather than Nothing.